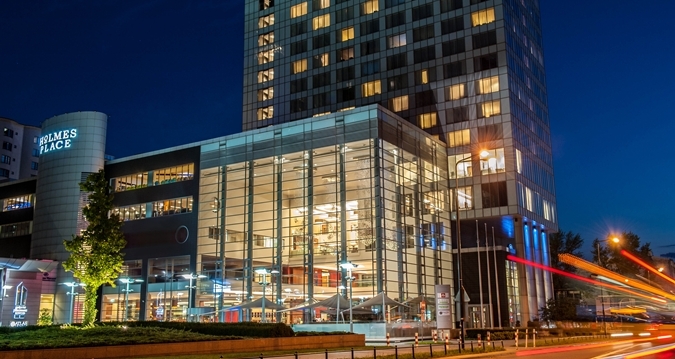 Another community-driven Magento event is shaping up in Europe – this time Poland will welcome a great group of international speakers and attendees and our team will again be there to take the main stage. Meet Magento Poland will take place on November 24th and 25th 2014 in Warsaw and to better prepare for this event, you should check out this interview with two Inchooers working hard to deliver some great content to everyone who will be there. Last year we had two speakers at this event, so we thought why not repeat that? This time around we have 4 people attending the event – our CEO Tomislav Bilić just likes Warsaw so much and couldn’t miss out on the opportunity to visit it again, and one of our frontend developers Nenad Andraković will also be there to network and provide some cheers for two of the featured speakers we have lined up in this year’s agenda, covering both business and tech tracks. And this interview is all about these two Inchooers who know their stuff and are not afraid to share the knowledge, so check out a Q&A session with the stars of the Croatian track – Toni Aničić (MCSS) and Marko Martinović (MCD+). Toni, Marko – faithful readers of our blog already know a thing or two about what you do, but what would you say if someone (like me, just now) asked you to share some basic things about yourselves? Toni: I’d say mind your own business! Kidding… I’m a 25 years old Croatian guy who enjoys fixing technical SEO issues, planning features, making sure that features work as they should, and most of all, seeing my clients’ KPIs grow. I also enjoy beer after work, but I rarely get a chance to consume one because girlfriend. Marko: I’m 10729 days old web developer from Croatia, into Linux and open source in general. I do what I like, and like what I do, therefore I probably take my job too seriously. Toni: I’ve been married to Magento for wonderful 6 years now. The funniest moment… Well we once inherited a project that had body and html tags closed from product descriptions. Intentionally. Now that I think of it, it might as well be a scary moment. Marko: I’ve been working with Magento for around 2 years now, which is relatively short period of time, although enough to get both annoyed and mesmerized by Magento and its features. I guess I got hooked at some point, still not sure how it happened. Out of all the moments, I’ll pick rewarding. For example, seeing 0.25 for 15 minutes load average, while watching several hundred concurrent shoppers browsing around what was once extremely unstable Magento store. Both of you will be speaking at the event – what have you prepared for all the participants? 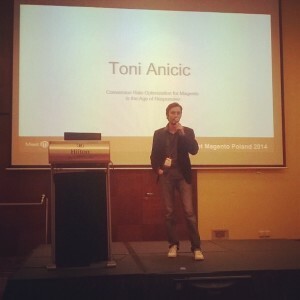 Toni: I’ll be speaking about conversion rate optimization for Magento in the age of responsive design. I’ll try to explain some of the terminology so that everyone in the audience can follow, explain the process we use, and share some advice on which parts of their website should they concentrate on and why that worked for us. Marko: I prepared detailed review of Magento 2 caching features, paying special attention to new page cache module with Varnish support. I believe Magento architects out there are in for one hard-core technical treat, assuming they visit Meet Magento Poland 2014. Why is your topic important and who will benefit most from listening to what you have to share? Toni: It’s important because, as people will see in my presentation, this process increases the amount of sales on an online store significantly. All of the store owners can benefit from this, be it small, medium or large, although the large ones will benefit the most. Marko: From our experience conversion rate is strongly tied to Magento store performance. Besides building quality Magento solutions, second greatest weapon to fighting performance issues is definitely caching. Since performance won’t stop being an imperative any time soon, it’s important to see how caching in Magento 2 fares compared to what was established for Magento 1. Marko, you’ve been getting your hands dirty with Magento2 for quite some time now. What’s your current impression on the progress it’s making and what do you look forward to in the months to come? Marko: Honestly, after opening Magento2 code for the first time I was thinking about making some career changes. Luckily I gave it some more time, and overall architecture started making more sense as the time went by. I’m not saying it’s all moonlight and roses when it comes to current state of Magento2 code, but I can see clear benefits for developers and merchants now. Toni, we all know just how SEO can make or break an eCommerce site, so if you had to choose, what would be your advice for one crucial SEO thing every store owner should pay special attention to when managing their online business? Toni: From the technical side of things, if I had to choose just one, I’d say duplicate content. Almost every Magento store I’ve ever seen had a lot of duplicate content issues. These issues can cause indexing problems for new stores and link juice dispersion problems for the established stores and in the most severe cases, even Panda penalties. This one goes to both of you – you’ve already seen the agenda, so who are you looking forward to meeting or listening to at Meet Magento Poland? Toni: I’m looking forward to seeing and listening to Ben Marks, as we’ve both been working with Magento since the early days but never had a chance to meet in person. I’ll definitely be listening to our friend Viacheslav from Atwix as he’ll talk about a very similar topic to mine. Marko: “Magento on HHVM” by Daniel Sloof looks very interesting, as well as “HTTP” by Fabian Blechschmidt, so I look forward to meeting both developers. Have you already visited Poland and what are you looking to see/do while here outside of the official Magento stuff? Toni: Yes. Last year I was a lecturer on Search Marketing Day in Poznan. Poland left a really good impression on me and thats why I’m coming back. Outside of the official Magento stuff? Huh… Since I only passed through Warsaw I never had an opportunity to explore it, so I’ll probably use the free time to do so. Nothing strictly planned. Marko: Since I’ve never been to Poland, whatever I see will certainly be interesting. Who’s your favorite Polish person and why? Toni: That’s a no brainer – Nicolaus Copernicus. Because science. Marko: To be honest, none comes to mind. But quick Google search revealed Jack Tramiel, founder of “Commodore International”, that alone makes him my new favorite Polish person. And finally, what’s one reason you think people should attend these community-driven Magento events around the world? Toni: Networking. Meet people who can help you solve some problem you have, explain something in their field, or introduce you to someone who has something you need. 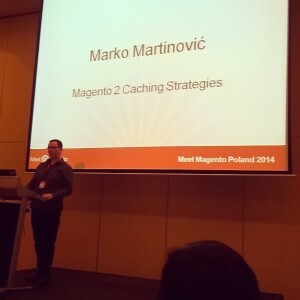 Marko: You are given chance to pick the brains of Magento developers all around the world. Nuff said. So there you have it – who wouldn’t want to meet and greet Toni and Marko (and don’t forget there are two more Inchooers attending) in Warsaw later this month? Marko Martinović and Toni Aničić on the stage at Meet Magento Poland. Taking too much time. And the trends says that Magento 2 is the best platform to flourish the e-Commerce market. So for production, I’d say we’re going to wait until midway through 2015 at least. any ideas when magento2 would be ready for production?